A friend recently asked for some tips how to identify spiders. Often the length and position of the legs are easy to see and can give you a clue. 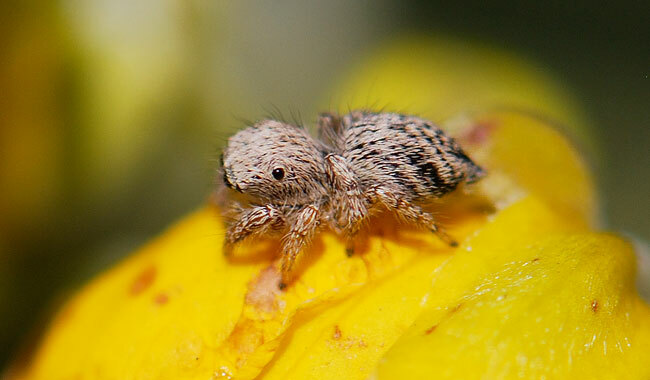 Jumping spiders like this one have short legs that are tucked up under their bodies. 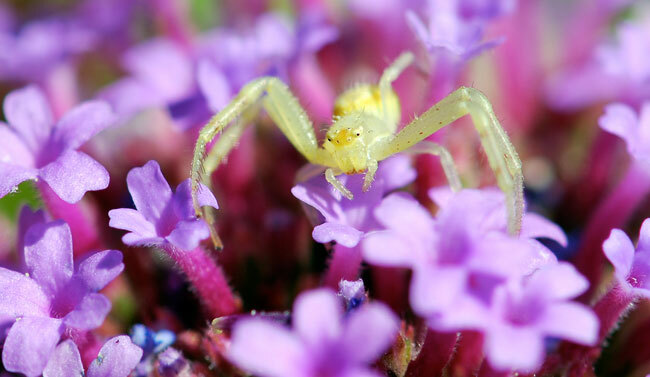 Crab spiders have 2 pairs of long front legs. They hold their front legs out to the side with the tips directed forward. Feather-legged spiders also have extra-long front legs. They hold their first pair of legs directly out front of themselves and pressed together. 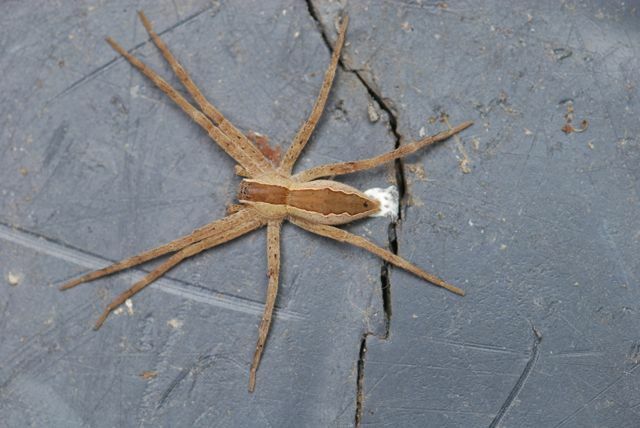 Wolf spiders have legs that are all roughly the same length and shape, as do a few other groups such as fishing spiders. Some spiders are easier to identify by their webs. 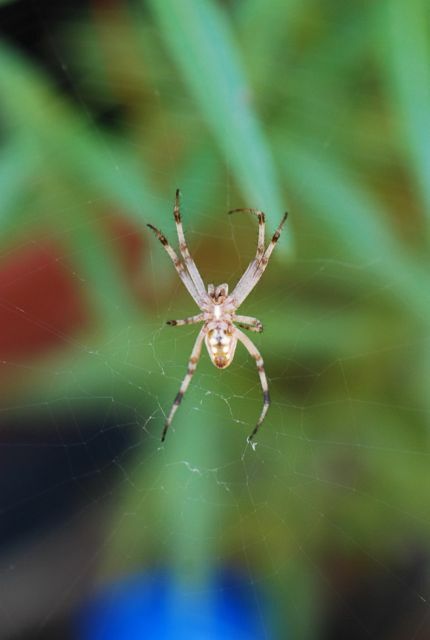 Orb weavers (also called garden spiders) produce large complex webs, often across paths. 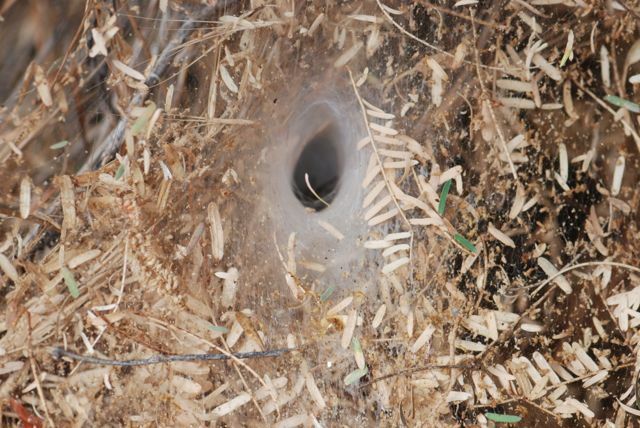 Funnel web spiders produce sheets of silk around a central, hollow retreat. If you can get a good photograph from the front of the spider, the size and position of the eyes can aid in identification. 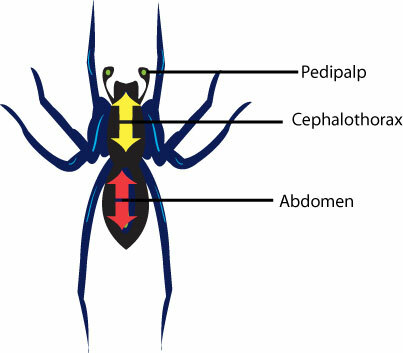 Let's take a quick look at spider anatomy, in case you are not sure which is the front end. 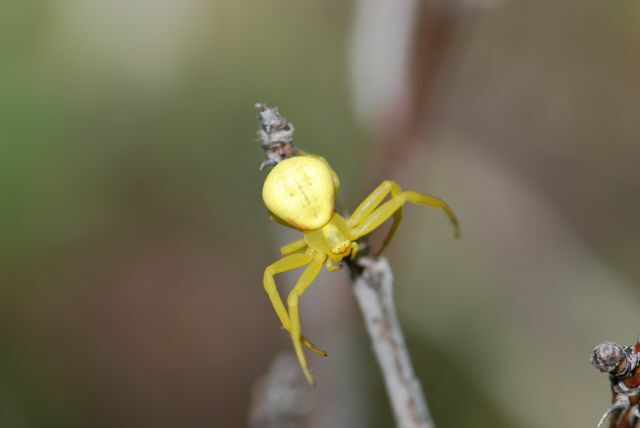 Besides the legs, the other parts you see on the spider are the abdomen (body area covered with red arrows), and the combined head and thorax, called the cephalothorax (body area covered with yellow arrows). The two appendages that surround the mouth are the pedipalps. The pedipalps are at the front end of the spider, with the eyes. (Note: in newer scientific texts the abdomen may be called an opistosoma and the cephalothorax called a prosoma). The eye patterns are distinctive and easy to recognize with a bit of practice. Looking face on at a jumping spider you can see they have two large eyes in the front of their cephalolthorax and two smaller eyes on either side. They also have two smaller pairs of eyes further back. See the dark, shiny eye about 1/2 way back on the cephalothorax? 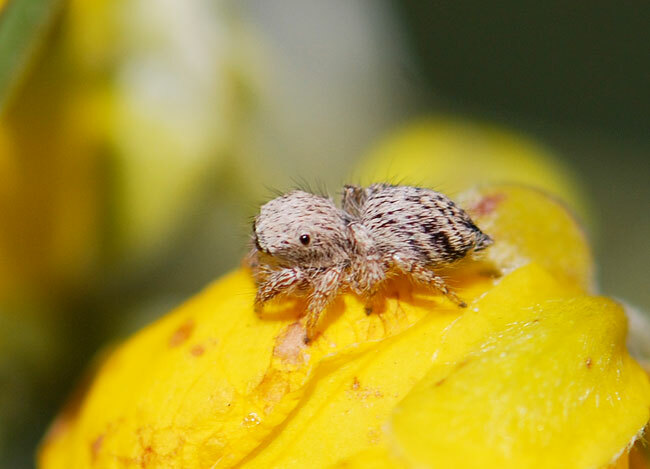 In contrast, the crab spiders have a cluster of tiny eyes right in a oval at the top and front. 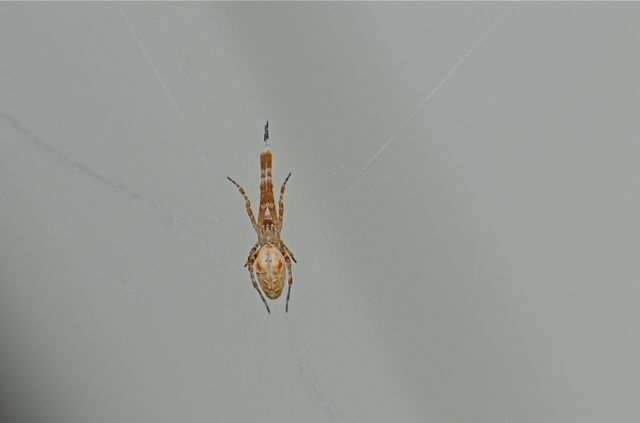 The eyes in this spider are set into the orange-yellow colored area. 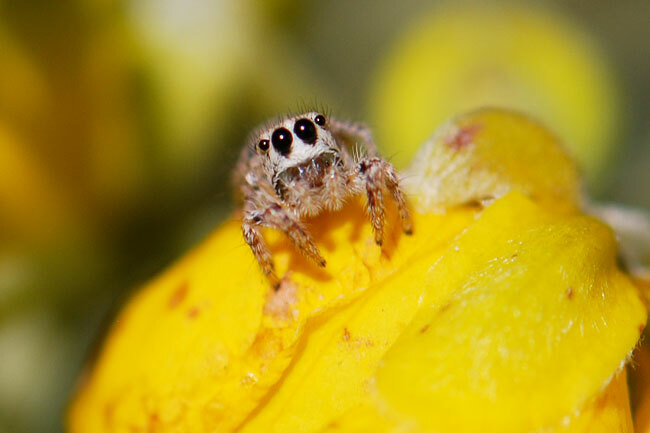 You can hardly see the eyes in comparison with those of the jumping spider. 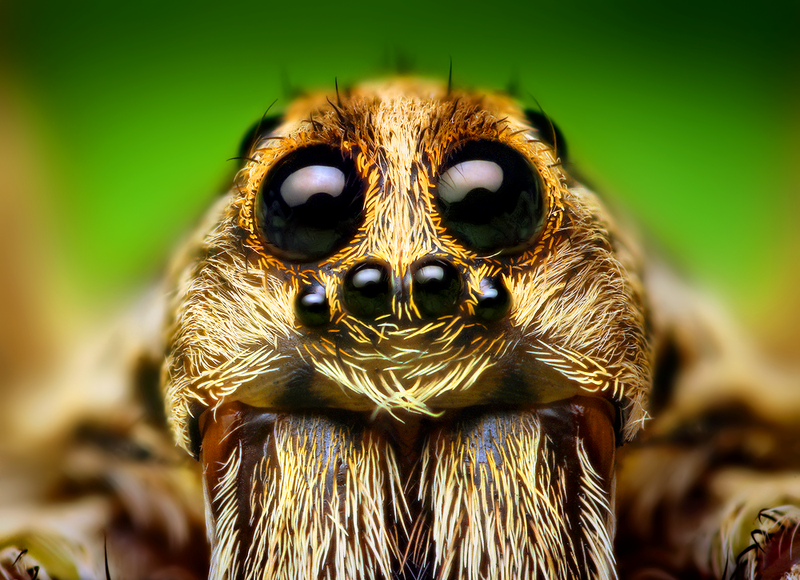 Wolf spiders also have two large central eyes, but have a downward-curving row of four eyes below them. They also have another pair further back, which you can just see as a dark curves. This is only a very basic introduction to spider identification. If you would like to learn more about this, BugGuide has set up an excellent page showing all the different eye patterns in spiders. Spiders have quite a bit going on and are actually quite fascinating once you get to know more about them.